A CCTV operator on Camden Council’s parking enforcement contract with NSL now faces the possibility of a ‘gross misconduct’ charge after being quoted in the Camden New Journal as part of its coverage of the opening day of a two-day strike by some 160 UNISON members in an increasingly bitter dispute over pay and condition. The worker, who is 30 weeks pregnant and was due to start maternity leave in less than three weeks, was reportedly in a state of shock after attending an investigative interview with local managers on Thursday afternoon (19 July). She was among a group of strikers interviewed by local journalist Pavan Amara while proceeding to a lunch-time rally at Camden Town Hall on the first day of the strike action. Following the strongly supported two-day walkout a mass meeting of 140 Camden NSL workers voted unanimously for further strike action, which could coincide with the Olympics, if the company does not offer significantly greater concessions. For further information, interviews, etc please contact either George Binette (branch secretary) in the Camden UNISON branch office (details below). TEL: 020 7974 1633/Mobile: 07905 826304/BlackBerry: 07557 563 044. 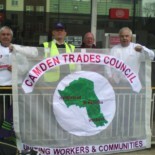 This entry was posted on July 19, 2012 by CAMDEN TRADES COUNCIL.